Linear, C-rich, ssRNA(+) genome of 6-7 kb. There is no VPg at the 5'-terminus. Some members (but not the type member) have a polyA tail at the 3'-terminus. The virion RNA is infectious and serves as both the genome and viral messenger RNA. The genomic RNA encodes a large replication polyprotein which is cleaved. 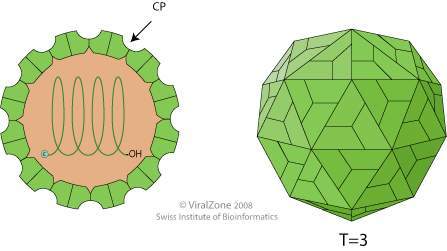 The capsid proteins are probably translated from a 3'-coterminal subgenomic RNA.